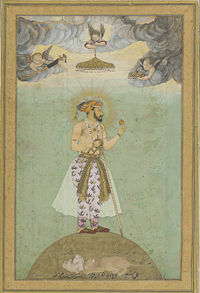 Shabuddin Mohammed Shah Jahan (full title: Al-Sultan al-'Azam wal Khaqan al-Mukarram, Abu'l-Muzaffar Shihab ud-din Muhammad, Sahib-i-Qiran-i-Sani, Shah Jahan I Padshah Ghazi Zillu'llah [Firdaus-Ashiyani]) (also spelled Shah Jehan, Shahjehan. Urdu: شاه جهان), (January 5, 1592 – January 31, 1666) ruled the Mughal Empire in the Indian subcontinent from 1628 until 1658. The name Shah Jahan comes from Persian meaning "King of the World." He stood as the fifth Mughal ruler after Babur, Humayun, Akbar, and Jahangir. While young, Akbar favored him. Even while a child, many pointed him out as the successor to the Mughal throne after the death of Jahangir. He succeeded to the throne upon his father's death in 1627. Considered one of the greatest Mughals, his reign has been called the Golden Age of Mughals. Like Akbar, he eagerly expanded his empire. The destruction of the kingdom of Ahmadnagar (1636), the loss of Kandahar to the Persians (1653), and a second war against the Deccan princes (1655) stood out as the chief events of his reign. In 1658, when he fell ill, his son Aurangzeb confined him in the citadel of Agra until his death in 1666. During the period of his reign, Mughal architecture experienced a golden age. Shah Jahan erected many splendid monuments, the Taj Mahal at Agra built, as a tomb for his wife Mumtaz Mahal (birth name Arjumand Banu Begum), by far the most famous. The Pearl Mosque at Agra and the palace and great mosque at Delhi also commemorate him. The celebrated Peacock Throne, worth millions of dollars by modern estimates, also dates from his reign. He founded Shahjahanabad, now known as 'Old Delhi'. The important buildings of Shah Jahan include the Diwan-i-Am and Diwan-i-Khas in the fort of Delhi, the Jama Masjid, the Moti Masjid and the Taj. The Palace of Delhi has been proclaimed by many as the most magnificent in the East. Shah Jahan, born as Prince Khurram Shihab-ud-din Muhammad in 1592 in Lahore, had been the third and favorite son of the emperor Jahangir. His mother Rathore Rajput Princess, known as Princess Manmati, Jahangir's wife. His grandfather, Akbar, gave him the name Khurram (Persian for 'joyful'). His early years saw him receive a cultured, broad education and he distinguished himself in the martial arts and as a military commander while leading his father's armies in numerous campaigns: Mewar (1615 C.E., 1024 AH), the Deccan (1617 and 1621 C.E., 1026 and 1030 AH), Kangra (1618 C.E., 1027 AH). He had been responsible for most of the territorial gains during his father's reign. He also demonstrated a precocious talent for building, impressing his father at the age of 16 when he built his quarters within Babur's Kabul fort and redesigned buildings within Agra fort. Emperor Jahangir weighing his son, 'Prince Khurram' in gold in 1607, Tuzk-e-Jahangiri (Jahangirnama). In 1607 C.E. (1025 AH) Khurrum married Arjumand Banu Begum, the grand daughter of a Persian noble, just 14 years old at the time. She became the unquestioned love of his life. They had to wait five years before they marrying in 1612 C.E. (1021 AH). After their wedding celebrations, Khurram "finding her in appearance and character elect among all the women of the time," gave her the title Mumtaz Mahal (Jewel of the Palace). The intervening years had seen Khurrum take two other wives, Akbarabadi Mahal (d.1677 C.E., 1088 AH), and Kandahari Mahal (b. c.1594 C.E., c.1002 AH), (m.1609 C.E., 1018 AH). By all accounts, Khurrum loved Mumtaz dearly, showing little interest in exercising his polygamous rights with the two earlier wives, other than dutifully siring a child with each. According to the official court chronicler Qazwini, the relationship with his other wives "had nothing more than the status of marriage. The intimacy, deep affection, attention and favor which His Majesty had for the Cradle of Excellence [Mumtaz] exceeded by a thousand times what he felt for any other." A nineteenth century illustration of Jahan. 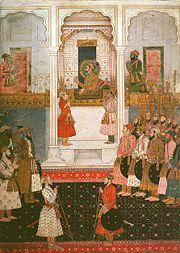 Princely sons competing to achieve military successes and consolidating their power at court determined inheritance of power and wealth in the Mughal empire rather than primogeniture. That often led to rebellions and wars of succession. As a result, a complex political climate surrounded the Mughal court in Khurram's formative years. In 1611, his father married Nur Jahan, the widowed daughter of a Persian immigrant. She rapidly became an important member of Jahangir's court and, together with her brother Asaf Khan, wielded considerable influence. Arjumand, Asaf Khan's daughter, consolidated Nur Jahan and Asaf Khan's positions at court through her marriage to Khurrum. Khurram's military successes of 1617 C.E. (1026 AH) against the Lodi in the Deccan effectively secured the southern border of the empire. His grateful father rewarded him with the prestigious title 'Shah Jahan Bahadur' (Lord of the World) which implicitly sealed his inheritance. Court intrigues, including Nur Jahan's decision to have her daughter from her first marriage wed Shah Jahan's youngest brother and her support for his claim to the throne led Khurram, supported by Asaf Khan, fostered open revolt against his father in 1622. Jahangir's forces quelled the rebellion in 1626, forcing Khurram to submit unconditionally. Upon the death of Jahangir in 1627, Khurram succeeded to the Mughal throne as Shah Jahan, King of the World and Lord of the Auspicious Conjunctions, the latter title alluding to his pride in his Timurid roots. Despite her frequent pregnancies, Mumtaz Mahal traveled with Shah Jahan's entourage throughout his earlier military campaigns and the subsequent rebellion against his father. Mumtaz Mahal utterly devoted herself to Khurrum; she served as his constant companion and trusted confidante; they enjoyed an intense love for each other. Shah Jahan's chroniclers portrayed her as the perfect wife, free of aspirations to political power. Nur Jahan had been perceived as completely opposite, craving political power. Although generally peaceful during his father's rule, the empire experienced challenges by the end of his reign. Shah Jahan reversed that trend by putting down a Islamic rebellion in Ahmednagar, repulsing the Portuguese in Bengal, capturing the Rajput kingdoms of Baglana and Bundelkhand to the west and the northwest beyond the Khyber Pass. Under his rule, the state became a powerful military machine and the nobles and their contingents multiplied almost fourfold, placing crushing demands for more revenue on the peasantry. General stability prevailed through a centralized administration and well-regulated court affairs. Historiography and the arts increasingly became instruments of propaganda, where beautiful artworks or poetry expressed specific state ideologies which held that central power and hierarchical order would create balance and harmony. The empire continued to expand moderately during his reign but the first signs of an imperial decline appeared in the later years. His political efforts encouraged the emergence of large centers of commerce and crafts—such as Lahore, Delhi, Agra, and Ahmedabad—linked by roads and waterways to distant places and ports. He moved the capital from Agra to Delhi. Under Shah Jahan's rule, Mughal artistic and architectural achievements reached their zenith. Shah Jahan engaged in prolific building with a highly refined aesthetic. He built the legendary Taj Mahal in Agra as a tomb for his beloved wife, Mumtaz Mahal. Other surviving buildings include the Red Fort and Jama Masjid in Delhi, the Shalimar Gardens of Lahore, sections of the Lahore Fort (such as Sheesh Mahal, and Naulakha pavilion), and his father's mausoleum. Legend states that Shah Jahan wanted to build a black Taj Mahal for himself, to match the white one he reportedly loved much more. Scholarship fails to support that speculation. His son Aurangzeb led a rebellion when Shah Jahan became ill in 1657 C.E. (1067 AH) and publicly executed his brother and the heir apparent Dara Shikoh. Although Shah Jahan fully recovered from his illness, Aurangzeb declared him incompetent to rule and put him under house arrest in Agra Fort. Jahanara Begum Sahib voluntarily shared his eight-year confinement and nursed him in his dotage. In January of 1666 C.E. (1076 AH), Shah Jahan fell ill with strangury and dysentery. Confined to bed, he became progressively weaker until, on January 22, he commanded the ladies of the imperial court, particularly his consort of later year Akrabadi Mahal, to the care of Jahanara. After reciting the Kalima and verses from the Qu'ran, he died. Jahana planned a state funeral to include a procession with Shah Jahan's body carried by eminent nobles followed by the notable citizens of Agra and officials scattering coins for the poor and needy. 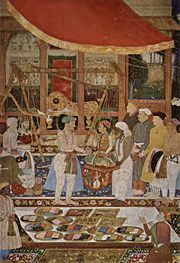 Aurangzeb refused, washing his body in accordance with Islamic rites, taking his sandalwood coffin by river to the Taj Mahal and interred him next to the body of his beloved wife Mumtaz Mahal. Shah Jahan built Taj Mahal over the tomb of his wife Mumtaz Mahal. Shah Jahan's legacy has been one of the most profound of all the Mughals. A patron of the fine arts, he continued the Mughal patronage of painting, although his passion resided in architecture. Shah Jahan has left behind a grand legacy of structures constructed during his reign, with the the Taj Mahal standing in the spotlight. His other constructions include Delhi Fort also called the Red Fort or Lal Quila (Hindi) in Delhi, large sections of Agra Fort, the Jama Masjid (Grand Mosque), Delhi, the Wazir Khan Mosque, Lahore, Pakistan, the Moti Masjid (Pearl Mosque), Lahore, the Shalimar Gardens in Lahore, sections of the Lahore Fort, Lahore, the Jahangir mausoleum—his father's tomb, the construction overseen by his stepmother Nur Jahan and the Shahjahan Mosque, Thatta, Pakistan. He also had the Peacock Throne, Takht e Taus, made to celebrate his rule. Painting during his reign reflected the serene prosperity that the Mughals enjoyed with many scenes reflecting Shah Jahan's interest in romance. A crater has been named after Shah Jahan on the minor planet 433 Eros. Astronomers name craters on Eros after famous fictional and real-life lovers. ↑ Vidya Dhar Mahajan, Muslim rule in India (Delhi: S. Chand, 1970). ↑ Neria Harish Hebbar, "King of the World: Shah Jahan." History of Islam in India (Boloji Media Inc). Retrieved June 23, 2008. ↑ Catherine Ella Blanshard Asher, "Architecture of Mughal India," The New Cambridge history of India, I, 4. (Cambridge: Cambridge University Press, 1992), 170. ↑ Ebba Koch and Richard André Barraud, The complete Taj Mahal: and the riverfront gardens of Agra (London: Thames & Hudson 2006), 18. ↑ Sheila S. Blair and Jonathan M. Bloom, The art and architecture of Islam 1250-1800. The Pelican history of art (New Haven: Yale University Press, 1995). Retrieved June 23, 2008. ↑ Encyclopedia of World Biography on Shah Jahan Retrieved June 23, 2008. ↑ 8.0 8.1 8.2 Koch, Taj Mahal, p. 19. ↑ Encyclopedia Britannica Online - Rebellion of Khurram Retrieved June 23, 2008. ↑ Asher, Architecture, p. 170. ↑ 11.0 11.1 Asher, Architecture, p. 171. 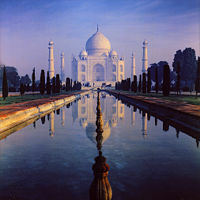 ↑ History of Taj Mahal Retrieved June 23, 2008. ↑ Black Taj Mahal Myths Retrieved June 23, 2008. ↑ Black Taj Mahal Story Retrieved July 8, 2008. ↑ Black Taj Mahal Spirituality Retrieved June 23, 2008. ↑ Koch, Taj Mahal, p. 101. This page was last modified on 10 September 2015, at 19:36.